When in doubt, have fries. Have you ever met anyone who refused a piping hot French fry? We haven’t, and in case you have, we hope you’re not in touch with them. Keeping the calorie-talk aside, who in their right mind would say no to the one food item that has the potential to bring peace and happiness to the world? We don't know when, where or who turned potatoes into fries but we are glad they did. This quintessential fast food is as universal as our emotions. From the smallest take-outs to Michelin-star restaurants, there’s hardly any country, city or even a town that could survive without a small kiosk of French fries. Some like their fries crispy while others prefer fluffy, scroll down to see how this simple yet oh-so-delicious snack is eaten around the world. You might find some crazy ways to chop, fry or drizzle your potatoes the next time around. Some consider Belgium to be the fortunate birthplace of fried potato making this golden snack the show star of Belgian street-food. Thick, short and incredibly fluffy, fries (or Frites, as locals call it) are fried twice. The first time cooks them through and makes them tender. The second time, which can be done hours later just before serving, turns them golden brown and deliciously crisp. You'll find tourists and locals strolling with cone-shaped card boxes filled with these golden potatoes. Fries in The Netherlands are cooked in the same manner as in Belgium but with a little addition of Dutch mayonnaise (which is a bit spicier than American mayonnaise). As for the generous toppings, the Dutch use curry, peanut sauce and last but not the least, tomato ketchup. Contrary to its name, France has little to do with the invention of fries. French prefer their potatoes thin and crispy and as a side to main dishes. They're served hot with a variety of sauces and dips. Apart from dipping them into chocolate, Japanese like their fried potatoes cooked in powder then left until ready to eat. A heavy dose of seasoning powder, dry soy, ground seeds and spice mixtures add a unique taste to the potatoes. And if that's not crazy enough, they're served in cool anime character boxes. Crispy golden from the outside, moist and succulent from inside — when done right, nothing says London better than a piping hot plate of fish n chips. 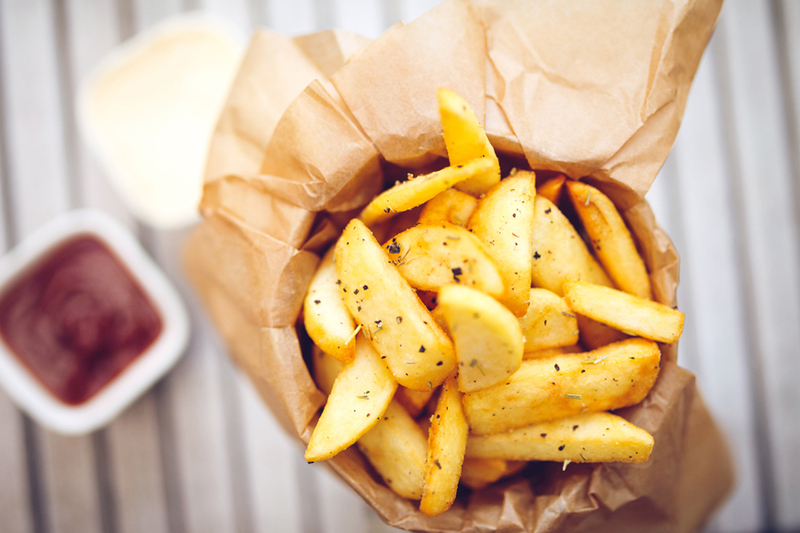 Brits like their chips as a side to battered fish. The chips are served with a sprinkling malt vinegar and then wrapped in newspaper or boxes. You can trust Filipinos to add the most bizarre toppings on their fries and still get away with it. Fries in the Philippines are devoured with banana ketchup — a sauce made with mashed bananas, vinegar, sugar and spices that are often dyed red to resemble tomato ketchup. Hmm, not sure if we want our fries to taste like banana. Poutine, the staple Canadian comfort food features fries front and centre. In this dish, French fries are first cooked centre medium-thick perfection. From there, they’re plated and topped with cheese curds and gravy. It may be a bit of an acquired taste, but poutine-lovers swear by this regional fry delicacy.